White ink UV printing is a highly specialized solution for making a glass partition transparent and opaque simultaneously. This means that certain areas of the glass remain transparent. At the same time, the area that contains images, becomes opaque. In traditional printing systems, there is no white ink and you just print on a white sheet of paper or media like white vinyl. The non image area ( the area where the printer fires no inks ) remains white and the rest of the image is reproduced in whatever color you want through the science of four color printing. But a print on white vinyl is entirely opaque. Hence, it is unsuitable if you want to paste the film on glass and retain the glass partition’s transparency. 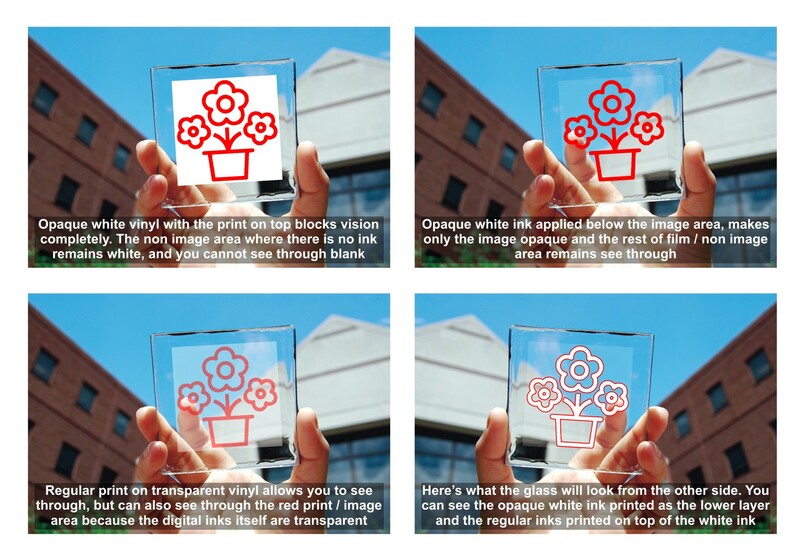 Alternatively, one can print on transparent vinyl to create a see through film for glass. But the problem here is that you can see through the printed area as well. This is because digital printing inks, unlike screen printing inks are entirely transparent. If you look at the first column of the second row in the above image, you will find it slightly dull. This is because light is passing through the transparent inks as well as the rest of the vinyl. This results in a reduction of the vibrancy of the print. When you print on a transparent surface like a sheet of glass, there is no base white and you can see through the inks printed on the surface. White ink UV printing overcomes this problem. Here is what happens. We first deposit a layer of white ink on the transparent media. This layer is in the same shape of the final image. The regular four color image is then overprinted above the white ink layer. The white ink is opaque. And since the regular inks are overprinted on top of the white UV ink layer, the printed area also becomes opaque. The non print area, where there are no inks, remains transparent. This gives us a beautiful dual effect of a partly transparent and partly opaque glass film. The result is a beautiful, vibrant and opaque image on a transparent surface. The above images are for a project executed for Ms. Shubham of Acuiti Consultants, Baner. She had two office partitions made of glass and she wanted to brand the same with a glass printing film. This client wanted to display a flow chart of her business processes on the partition. There was a workroom on the other side and she wanted to be able to see on the other side as well. Moreover, the film had to be pasted from behind the sheet of glass, because she wanted to make notations with a white board marker on the partition, from the front. We used white ink UV printing to give her a satisfying solution. Hi! I have a question: what percentage of transparency is applied to the white areas to make them look like frosted glass?